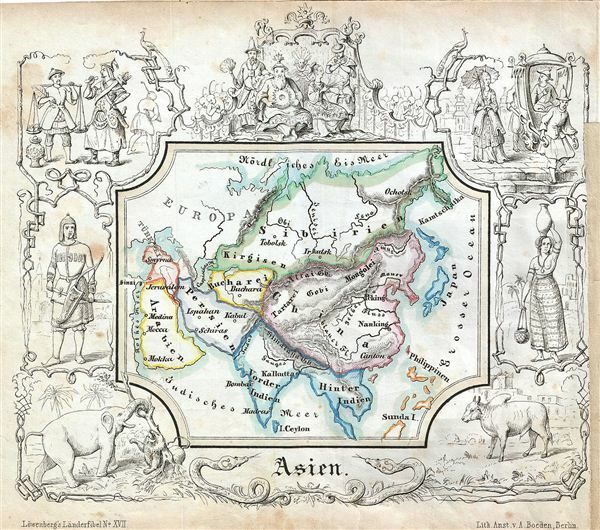 A delightfully whimsical 1846 map of Asia, from a German kinderatlas or children's atlas. The map covers the all of Asia from Siberia in the north to Ceylon in the Indian Ocean including Philippines and from Arabia in the west to Japan in the east. The whole is surrounded by a wide border featuring charming vignettes meant to illustrate the peoples and cultures of the region. These include an elephant fighting a lion, a cow, a scene from a royal court, men carrying a Chinese man in a palanquin, a portrait of a woman carrying a pot over her head, and a portrait of an archer. The map is accompanied by its adjacent page, which includes a poetic history of Asia in German gothic type. The wonderful and rare map was drawn by Anst. V A. Boeden of Berlin for inclusion as plate no. XVII in the 1846 issue of Julius Loewenberg's Geographische Landerfibel.